You are here: Home / Being Human / Time to decomplicate; self-improvement traps; get on social media? Beginning at a young age, we are enveloped by a world of artificial complexity. Through observation of those around us who suffer from a belief in artificial complexity, and indoctrination via media and marketing, our tendency towards complexity illusions are deeply etched into us. While this is a topic that will be touched on repeatedly at BigSkyRise, to get a great introduction to it and begin the process of decomplicating your world, read through this excellent post by Nat Eliason, and give the points it presents some consideration. As noted in the above article, when there is a whole industry around a problem shared by a vast percent of humans, there is likely a simple solution hiding somewhere in plain sight. One of those industries where simple solutions are masked by complexities is the self-esteem industry. 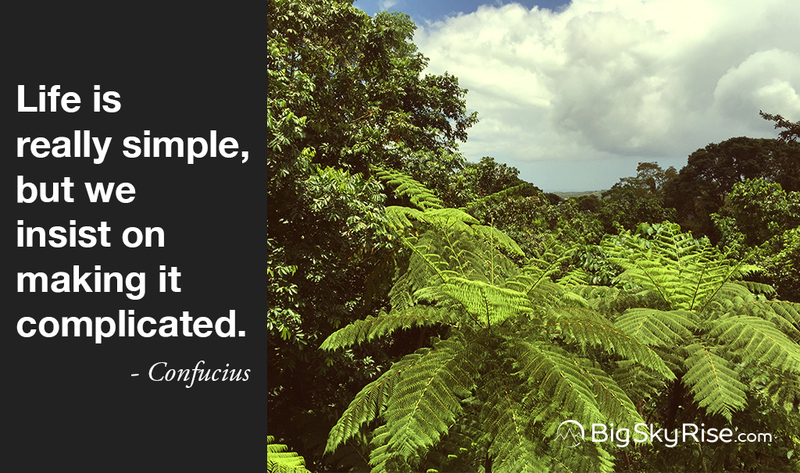 While there are lots of good, useful, and important insights being shared, and many people working to make the lives of others better, there is also a strong chance of getting lost in unnecessary complexity. Headspace’s Andy Puddicombe touches on a simple way to step away from extraneous noise. Along with seeing how to step back from the noise in the self-improvement and self-development worlds, clearing away a few myths helps in seeing some of the greater simplicity we often lose track of. To that end, this article from Fast Company points out five personal development myths that can easily get you off track and that are important to be aware of. While clearing away the five common personal development myths mentioned above, be sure to watch out for the self-improvement trap as well. The self-improvement trap is an easy way to get distracted by an endless and unquenchable desire that will block yourself. In the same way that it is easy to fall into the self-improvement trap, it can be easy to fall into the trap of believing your worth comes from what you achieve. That judgement of achievement can be in any area of life, including self-improvement, and is as incessant as any other desire. This personal story on how your worth doesn’t come from what you achieve illustrates that well and shares some good lessons at the same time. Perhaps, taking the step to fully disconnect from the social media stream is a bit hard at the moment. In that event, a good step to take is simply to approach the relentless social stream with some mindfulness. Perhaps, you’ll encounter a few of the helpful aspects of social media in the process. Or, perhaps, you’ll decide the costs aren’t worth the benefit. Life’s problems are complicated, or perhaps it’s just that we make them complicated even when the problems and solutions are rather simple. It’s easy for us to get swept away into making things more complicated than they need to be. At the same time we fall into traps, such as when we fuel and grow our desires at the expense of being in the now — even when it’s for something like self-improvement.